Twins Rock Media has announced the release of ZooZoom Crew: Snow Adventure on iOS devices, challenging players to ski down the mountain, running over snowmen and skiing through gates while collecting coins. The game was created by 12-year-old twin sisters from a gaming and skiing family, which includes Doodle Jump creator Igor Pusenjak. ZooZoom Crew: Snow Adventure is a downhill endless “skier,” as players tilt their devices left or right to control the direction of one of four animal characters as they ski down the mountain. 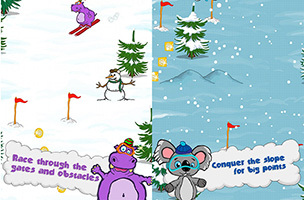 Players can collect coins between gates, tap on the screen to throw snowballs at snowmen, and avoid trees as the course becomes more treacherous over time. If the action is too slow or fast, players can swipe up or down on the screen to change their characters’ speed. Players can purchase upgrades to coin-collecting magnets and shields for avoiding trees, and can complete sets of missions to unlock higher score multipliers. The developer has also announced plans to bring additional environments to the game in the future. ZooZoom Crew: Snow Adventure is available to download for $0.99 on iOS. Check back soon to follow the game on AppData, our tracking service for mobile and social apps and developers.